The EU's competition chief says she is looking into Amazon's use of data from sellers on its site amid concerns that it might harness it to boost its own retail sales. 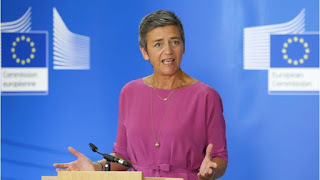 Margrethe Vestager warned of a potential conflict between the US firm's role as both a selling platform and a retailer competing for business. However, she said it was "early days" and no formal case had been launched. Her office has sent questionnaires to merchants and others involved. "The question here is about the data," she said at a press conference, noting that Amazon could use insights from merchant sales to help its own retail business. "We have no conclusions... We are trying to make sure that we get the full picture." Amazon, which reported sales of nearly $180bn (£137bn) last year, declined to comment. The investigation reflects growing concern about Amazon's rising market power both in the US and abroad. The company is a dominant player in online shopping and has a leading cloud services business, but its wide-ranging offerings also include music, logistics and advertising.